180 pages | 27 B/W Illus. The increasing scarcity of land and the ever-rising amount of waste produced worldwide, coupled with the consequent change of focus by policy makers from waste disposal and recovery to waste prevention is boosting research in the 'economics of waste'. 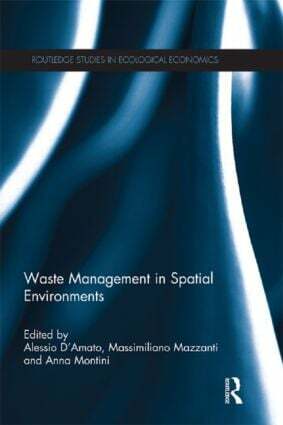 This volume addresses waste-management and waste-disposal issues, embedding them in spatial, systemic and trade-related frameworks. The collection is policy oriented, including socio-economic and political science perspectives in order to provide an understanding of real world phenomena, and thus maximize its value for policy making. The book includes contributions on the linkages between income and waste generation and landfilling (such as the ‘waste Kuznets curve’ conceptual framework), in addition to papers that bring together policy-oriented analysis of instrument effectiveness and the spatial nature of waste phenomena. On top of this, there are pieces of research emphasizing technological spillovers and trade at interregional and intercountry levels. The comparative analysis of policy effectiveness and efficiency at the regional and country levels is also covered, including the assessment of the potential role of illegal management of waste in determining waste performance. To give a spatial and comparative flavour, the book includes work on the evaluation of waste-related externalities, with examples covering household, industrial and special waste. The wide set of methodologies and issues included in this book make it a comprehensive starting point for scholars and policy makers interested in waste-related research. Alessio D’Amato is Assistant Professor and Lecturer in Public Economics and Environmental Economics at the University of Rome "Tor Vergata", Italy. His research activity is focused on incentive theory, environmental regulation under asymmetric information, waste policy in the presence of illegal disposal and organized crime, and emissions trading. Massimiliano Mazzanti is Associate Professor in the Department of Economics and Management at the University of Ferrara, Italy. His research deals with environmental policy, the economics of innovation, waste management and policy, and climate change and development. Anna Montini is Assistant Professor in Economics, and Lecturer in Environmental Economics at the University of Bologna, Italy. Her main research interests lie in environmental economics and policy, waste management and environmental-economic performance at the spatial level.